Issued to every soldier was the trouser belt. This belt was issued in an appropriate length, and was to be shortened if necessary. 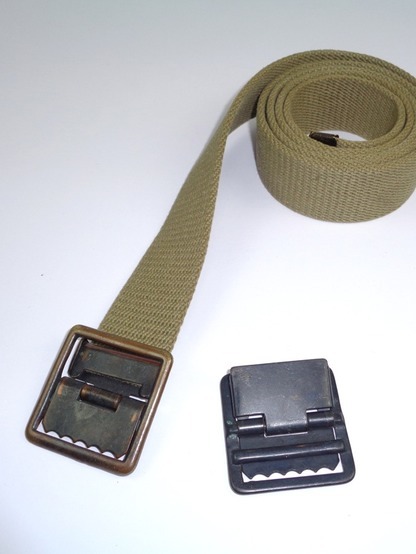 This belt was of 1 1/4 inch wide webbing with an open frame buckle. This buckle was stamped out of brass. Variations exist being made of cast brass, an alloy (as an economy measure), or stamped out of sheet metal. 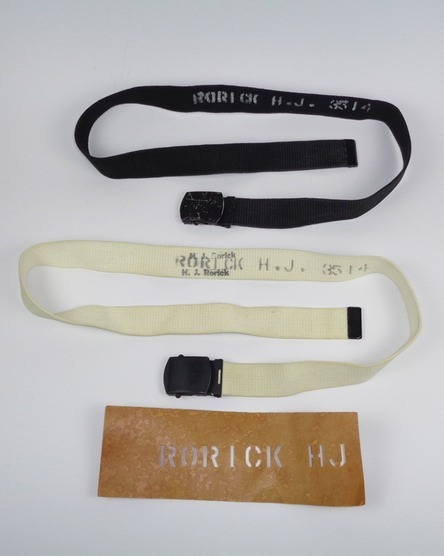 The official nomenclature as given in the Quartermaster Supply Catalog is: Belt, Waist, Web, EM, M-1937 (1 1/4” Wide). From left to right: stamped brass, cast brass, stamped sheet metal (brass) and the USMC cast brass belt buckle. On the reverse side of the belts is the Quartermaster information. Usually the belts are stamped: U.S. J.Q.M.D. Followed by the year of manufacture and size. J.Q.M.D. Stands for Jeffersonville Quarter Master Depot. The size is given in inches. Note that the 3rd belt is of the sheet metal brass type and is dated 1945. Also is the webbing made in OD #7. In 1945 brass wasn’t considered a critical materiel any more, but the sheet metal was still a method to save brass. All buckles were painted black. Officers had to buy their own uniform and for them the belt with the roller buckle was mandatory. This article concerns only the enlisted mans belt. Fun fact: All the mint belts I measured were approximately two inches shorter than indicated. The U.S. Marine Corps, as usual, had their own version of the trouser belt. Named Belts, Trousers, Woven, this belt was 1 5/8 inch wide. The frame is of a different design than the Army version. This belt could also be used connected to the coupling strap of the knapsack to form a bag carried slung over the shoulder. 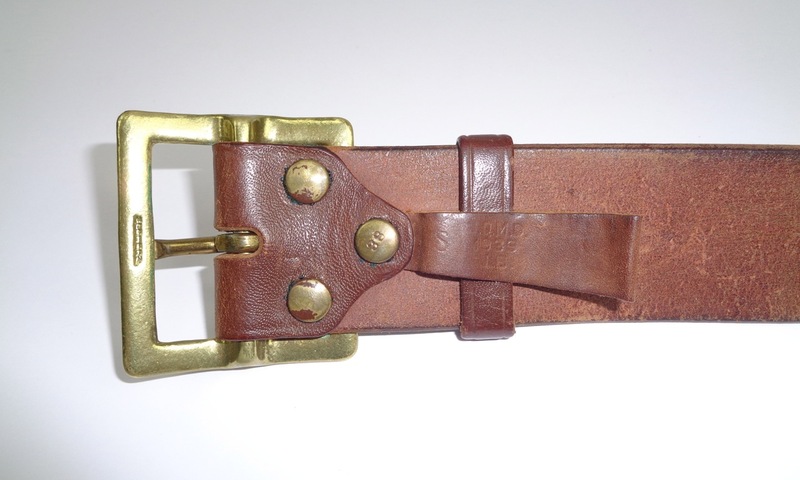 Postwar USMC buckles are gilded and are of the same with as the Army buckles. A variation with snaps for carrying waterproof pouches for anti-tank mines also exists, but was issued too late for being used during the war. 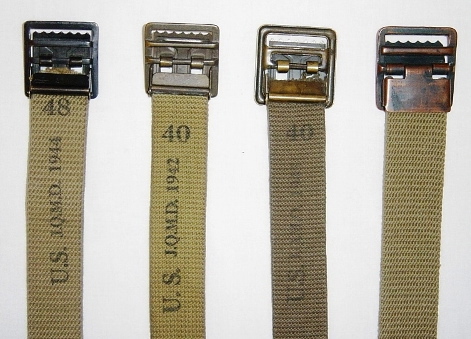 The U.S. Navy issued two webbing trouser belts for their enlisted men. One dark blue, actually black, for use with the dungaree uniform, and one white belt for use with the (un)dress white uniform. Although the cardboard template shown is not the one used for marking the belts, it is included to illustrate the means of stenciling the equipment. Until 1942 all U.S. Army soldiers were issued a Garrison Belt for wear with the Dress Blouse (Class A coat). 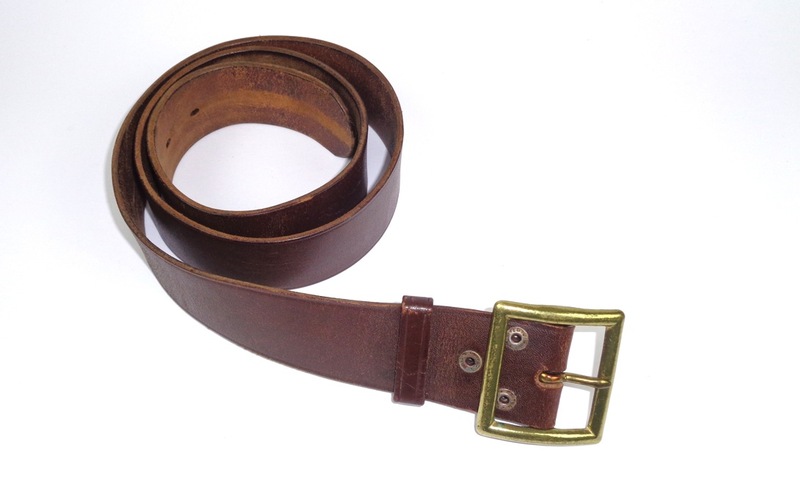 This belt was made from a heavy leather in the Army russet brown color with a removable brass buckle.